This morning I remembered falling in love with Ernie. Liz had a batch of kittens at home. She called, said she was sending her husband over with two kittens and I had to take them both. I was willing to visit with the kitties but I didn’t think I was keeping either of them. Along came Rusty with the kennel and out of it tumbled a cute black and white kitty. 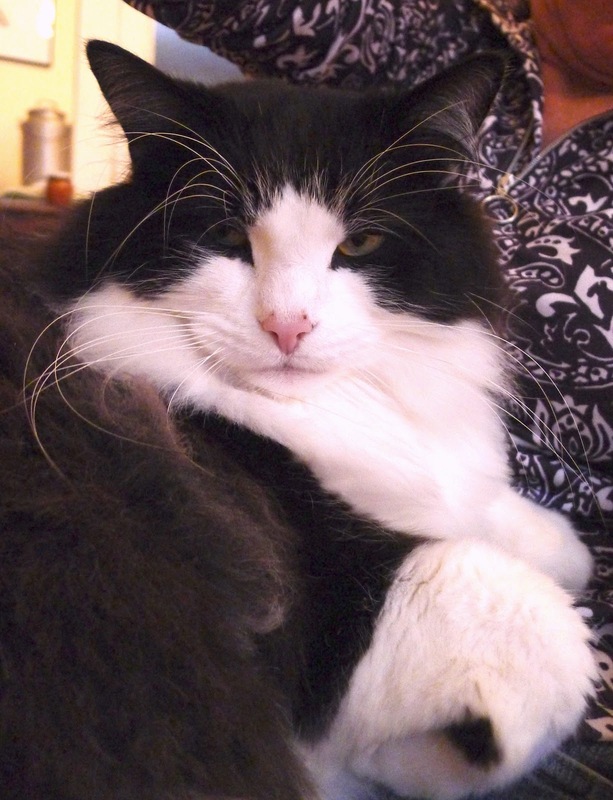 Then out of it sauntered this absolutely cross eyed, bowl legged, smushed faced long haired black and white man/kitty. I believe I might have gasped. He was an instantaneous yes for me. It was also clear to me Liz said take them both because she was sure no-one was ever going to pick that thing. Liz was quiet on the phone when I said I’d take the cross eyed one. Now here it is nine years later and Ernie is laying on my arm while I type. Some days I believe Ernie is the most beautiful cat I know. And as much as he has grown into his face, when people first meet Ernie, they might ask me what kind of animal he is, they are genuinely not sure he is a cat. At a glance, he could be mistaken for a skunk or a porcupine, he's so big and hairy he just doesn't look like what we think of as a cat. Ernest, like some art, teaches me about the uncomfortable feelings evoked by atypical beauty. Beauty can have some teeth to it. And when beauty does have teeth, it is often ineffable, nearly scary. Art can bring me into unexpected terrains, often by some combination of beauty and values. I don’t always love experiencing the ensuing mixed up feelings but I find myself grateful for the stretch.